Stacey Abrams is right not to concede. The Georgia Democrat, who hoped to become the state’s first Black governor, acknowledged that while she will no longer directly challenge Republican Brian Kemp for the office, she will fight as a private citizen to hold him accountable for his efforts to undermine voting rights in the state. Kemp, who until days ago was Georgia’s secretary of state, supervised his own election – an unprecedented affront to democracy, which prompted fellow Georgian and former President Jimmy Carter – who has helped certify transparency in hundreds of elections around the world – to demand that Kemp resign. Kemp has relentlessly sought to undermine the franchise at every level. He made wild, unsubstantiated claims of voter hacking – now quickly forgotten – and oversaw an unlawful purge of half a million voters, many of whom are African American, from rolls. Federal court rulings in lawsuits brought by the ACLU and journalist Greg Palast forced Kemp to reinstate 159,000 of these voters in time for the election, but many of those whose status he questioned were only given “provisional” ballots at the polls, many of which remained uncounted by a 5 p.m. deadline on Friday. 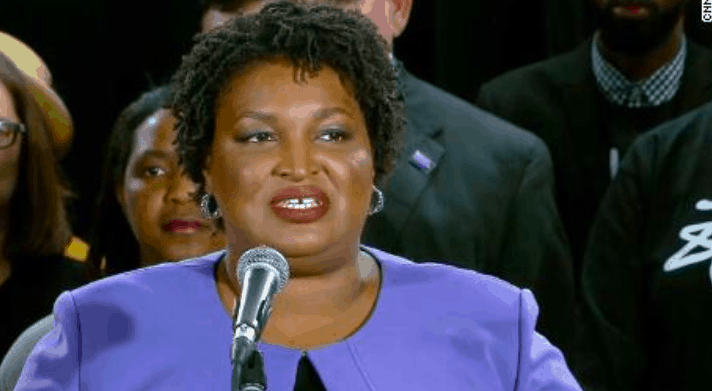 “To watch an elected official who claims to represent the people in this state baldly pin his hopes for election on the suppression of the people’s democratic right to vote has been truly appalling,” Abrams told supporters on Friday. She now plans to bring suit against Kemp through a new organization, Fair Fight Georgia, which will bring full scrutiny to Georgia’s unfair voting laws and practices, already before municipal elections next year. “We have to consider all the pieces that go into voter suppression and diminishing the ability of voters to cast their ballots,” she told the Atlanta Journal-Constitution. Kemp’s win comes at the end of the GOP’s 40-year campaign to undermine voting rights all across the country, through gerrymandering, purges of voter rolls, restrictive voter ID laws and direct intimidation. But voters are fighting back. Against all odds, Democrats wrested back control of seven governorships in midterm elections, electing more than 300 state representatives, regaining control of six state legislatures and ending GOP supermajorities in four states. The most notorious national advocate of voter suppression, Kansas secretary of state Kris Kobach, who inspired President Trump’s fantasy of 3 million “phantom” voters in the 2016 elections, just lost his bid to be that state’s governor. A new voting rights movement, spearheaded by champions like Abrams and former Attorney General Eric Holder, are challenging antidemocratic practices and distorted laws, and judges are ruling in their favor. And grassroots campaigns, like the ones led by Abrams and other candidates supported by People’s Action, have been going directly to voters, talking to them about the value of their vote and voice, in particular in North Carolina and other former states of the Confederacy, where laws of “moral turpitude” are still used to intimidate minority voters and keep them away from the polls. And the movement to restore the voting rights of returning citizens is growing, too. In Florida alone, 1.4 million more voters who had previously been excluded from voting because of prior criminal convictions will now have the opportunity to vote in the next elections. Similar initiatives are underway and gathering steam in Alabama, Georgia, Michigan, and beyond. So Stacey, go deep for democracy, and people of good will will follow you. And Brian, savor your victory now – because it will be fleeting. You, Kris and others have played a long and successful game to keep democracy in check, but that game is now played out. We will continue to go deep, reaching out to the hearts and minds of voters, and restoring faith in our democratic processes and the power of the ballot. You and other enemies of democracy are on the losing side of history – and the wind is at our backs, not yours.